A new scientific study claims that children and teenagers suffering from attention deficit hyperactivity disorder (ADHD) can experience a relief in their symptoms through the use of transcendental meditation. The paper also says that, when medical treatments fail, praying and meditating may prove to be a therapy worth trying. In a three-month-long study, the researchers in charge of the new experiment noticed a 50 percent decrease in middle school students’ stress levels, a noticeable change. "Medication for ADHD is very effective for some children, but it is marginally or not effective for others. Even for those children who show improved symptoms with the medication, the improvement is often insufficient or accompanied by troubling side effects," says study co-author William Stixrud, PhD, a clinical neuropsychologist in Silver Spring, Maryland. "Virtually everyone finds it difficult to pay attention, organize themselves and get things done when they're under stress. So it stands to reason that the Transcendental Meditation technique (TM) which reduces stress and organizes brain function would reduce ADHD symptoms," he adds. "The effect was much greater than we expected. The children also showed improvements in attention, working memory, organization, and behavior regulation. […] Teachers reported they were able to teach more, and students were able to learn more because they were less stressed and anxious," says Sarina J. Grosswald, Ed. D., a cognitive learning specialist at George Washington University, who is also the lead researcher on the new study. "What's significant about these new findings is that among children who have difficulty with focus and attention, we see the same results. TM doesn't require concentration, controlling the mind or disciplined focus. The fact that these children are able to do TM, and do it easily shows us that this technique may be particularly well suited for children with ADHD," Grosswald concludes, in the paper published online, in the journal Current Issues in Education. among students, according to a new study. Prior research shows ADHD children have slower brain development and a reduced ability to cope with stress. "Stress interferes with the ability to learn-it shuts down the brain," said William Stixrud, Ph.D., a Silver Spring, Maryland, clinical neuropsychologist and co-author of the study. Andy and Daryl Schoenbach's daughter was diagnosed with ADHD in second grade. Like most ADHD children she was taking medication. "The medication helped but had mixed results-she still lost focus, had meltdowns, and the medications affected her sleep and appetite," said Andy, who lives with Daryl in Washington D.C. "She was not performing close to her potential and we didn't see the situation improving. So at the end of seventh grade when her doctor recommended increasing the medication, we decided it was time to take a different course-stopping the medication and using Transcendental Meditation." "The results were quite remarkable," Daryl said. "The twice daily meditations smoothed things out, gave her perspective, and enabled her to be in greater control of her own life when things started falling apart. It took some time, but it gradually changed the way she handled crises and enabled her to feel confident that she could take on greater challenges -in her own words, 'climb a mountain.'" A third TM-ADHD study, to be funded by a $2 million grant from the David Lynch Foundation (DavidLynchFoundation.org), will more fully investigate the effects of the technique on ADHD and other learning disorders. * The Center for Disease Control reports that nearly 50 percent of the 4.5 million children (ages 4-17) in the United States diagnosed with ADHD are on ADHD medication-and the majority of those on medication stay on it in adulthood. * The rate of prescriptions for Attention Deficit Hyperactivity Disorder in the U.S. has increasing by a factor of five since 1991-with production of ADHD medicines up 2,000 percent in 9 years. * The commonly used drugs for ADHD are stimulants (amphetamines). These drugs can cause persistent and negative side effects, including sleep disturbances, reduced appetite, weight loss, suppressed growth, and mood disorders. The side effects are frequently treated with additional medications to manage insomnia or mood swings. Almost none of the medications prescribed for insomnia or mood disturbances are approved by the Food and Drug Administration (FDA) for use with children. * The long-term health effects of ADHD medications are not fully known, but evidence suggests risks of cardiac disorders and sudden death, liver damage and psychiatric events. It has also been found that children on long-term medication have significantly higher rates of delinquency, substance use, and stunted physical growth. 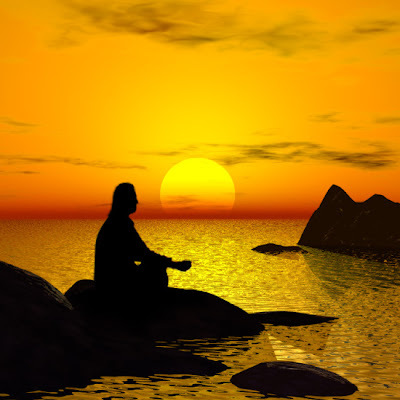 * The Transcendental Meditation technique is an effortless technique practiced 10-20 minutes twice a day sitting comfortably with the eyes closed. * TM is not a religion or philosophy and involves no new beliefs or change in lifestyle. * Over 350 peer-reviewed research studies on the TM technique confirm a range of benefits for mind, body and behavior. * Several studies have compared the effects of different meditation practices and found that Transcendental Meditation provides deeper relaxation and is more effective at reducing anxiety, depression and hypertension than other forms of meditation and relaxation. In addition, no other meditation practice shows the widespread coherence throughout all areas the brain that is seen with Transcendental Meditation. * The Transcendental Meditation technique is taught in the United States by a non-profit, educational organization. * More information can be obtained by calling 888-LEARN-TM or visiting www.ADHD-TM.org, www.AskTheDoctors.com, or www.TMEducation.org. December 29, 2008 - Dr Alex Kutai, Director of the Meditation Society of Israel, said today the violence and conflict in the Gaza, which threatens to engulf the region, can be “calmed literally overnight” through the strategic establishment of a peace-creating group of 500 advanced Transcendental Meditation experts in the country. Dr. Kutai said his solution is based on science, not mere hope, and invited philanthropists and well wishers of peace in the nation to partner with his nonprofit organization to establish the group on a permanent basis. “The cost would be less than $1 million—a fraction of what is spent each day on defense by the government,” he said. Dr. Kutai said the peace-creating group will safeguard Israel’s borders and make the country invincible by creating “coherent national consciousness” and neutralizing the acute underlying stress and tension which fuel violence and terrorism. “Nothing else has worked in the past—and nothing else will work today. This is the best approach for peace,” he said. The Transcendental Meditation program of Maharishi Mahesh Yogi is a simple, nonreligious, medically proven technique, which dramatically reduces stress and stress-related disorders and develops the total brain and creative potential of the individual. “When individuals practice Transcendental Meditation, along with the advanced Yogic Flying technique, together in a group, the calming influence spills over into the surrounding environment, dramatically reducing societal stress, crime, violence, and warfare,” Dr. Kutai said. Extensive research published in the world’s leading peer-reviewed scientific journals, including Yale University’s Journal of Conflict Resolution, has verified the peace-promoting effect of the meditation group (www.InvincibleDefense.org). On 16 December 2008 Parade Magazine reported: The National Institutes of Health estimates that Americans spend between US$36 billion and $47 billion out of pocket each year on alternative therapies that they consider important in taking care of their health. Research on the Transcendental Meditation Programme shows how the practice is effective in promoting heart health as well as in calming the mind. It is a joy for Global Good News service to feature this news, which indicates the success of the life-supporting programmes Maharishi has designed to bring fulfilment to the field of health. The article discussed Transcendental Meditation in the context of 'three commonly used mind-body therapies that have scientific backing and have passed the litmus test of rigorous medical inquiry'-acupuncture, a traditional Chinese practice that deals with the flow of energy; biofeedback, a relatively new technique designed to use the brain to control 'automatic' functions of the body; and meditation. The article described Transcendental Meditation (TM) as the 'most popular method' of meditation, and noted several scientific research results [among many published studies on the practice]. Raja Jose Luis Alvarez, Raja of Invincible Latin America for the Global Country of World Peace, recently reported that this year 158 schools in 19 Latin American countries are offering Consciousness-Based Education and Transcendental Meditation to their students. The number of students now practising Transcendental Meditation has reached 61,000, and 14,000 are practising Yogic Flying, thereby creating a powerful influence of coherence, harmony, and invincibility for their nations. Speaking on the Maharishi Global Family Chat on 11 December, Raja Luis presented news from six countries: Brazil, Ecuador, Colombia, Bolivia, Peru, and Mexico. Leaders of the programmes in some of these countries also spoke about the success of Consciousness-Based Education in the schools and the deep appreciation of the students, teachers, and parents for this programme. In Brazil, many schools in many locations are offering Transcendental Meditation and Consciousness-Based Education to their students, Raja Luis said. A leader of the programmes in the nation said that some of these students who are already practising Transcendental Meditation are now learning the advanced Transcendental Meditation Sidhi Programme, which includes Yogic Flying. The children are enjoying the programme so much, he reported, that they run after the Administrators asking when the next instruction will take place. He also reported that the society as a whole is reaping the benefit. One municipality of Brazil had the greatest drop in crime rate of all the municipalities of the entire state, after nearly 5,000 students in that municipality began practising Transcendental Meditation. The leader said that in one area 2,500 students from four different schools learned Transcendental Meditation and in a nearby area 2,200 students learned the technique. During the first month that all these thousands of students began learning Transcendental Meditation there was a 55 per cent drop in violent crime, and the following month there was a 40 per cent drop. The leader said that this is what they predicted would happen based on extensive scientific research—and further research is being conducted for this particular dramatic decrease in crime rate. Raja Luis expressed his appreciation and congratulations to all the dedicated leaders, Teachers of Transcendental Meditation, and Transcendental Meditation Sidhi Programme Administrators who are creating an unshakable basis of invincibility in Brazil. Students Danielle Eagle, 16, left, and Jasmine Contreras, 14, practice meditation at the Museum School for the Visual Arts. For 10 to 20 minutes twice a day, some students and teachers at alternative education programs in the Tucson Unified School District close their eyes and shush their minds. There are no chants or incense sticks or burning candles, although some will use a mantra — a phrase repeated over and over to themselves — to help slow their thoughts. Despite its simplicity, the practitioners report they're seeing significant benefits from Transcendental Meditation, the trademarked technique created by Maharishi Mahesh Yogi more than 50 years ago. Priscilla Ramos, an 18-year-old senior at Project MORE High School, said she was only passing some classes before. Now, even though she's carrying 10 classes in an attempt to graduate on time, she's focused and making A's and B's. Favian Marquez, a 17-year-old at MORE, said he used to "blow up really fast." Last month, some guy picked a fight with him on the bus, he said, shoving him and ultimately punching him in the face. "I got mad, but I controlled myself. I just said, 'It isn't worth it.' It's just helped me with my anger a lot." David Tran, 16, said he immediately felt the calming effects after his first session, even though he'd scoffed at it beforehand. Even his mother noticed he was less anxious and sleeping better, he said; she even asked him if he was feverish. The director of the district's alternative education department, Robert Mackay, acknowledges it all sounded a bit far-fetched to him when a teacher came back from a conference talking it up. Mackay said the students who come to him often are troubled, some with severe family and academic issues. In some cases, his programs are their last hope of graduating. "I had grave doubts because I had never seen some of these kids ever stop moving or talking. I expected that we'd have a 15-minute discussion and that would be it," he said. Instead, he heard the pitch, including testimonials from schools around the nation using it with populations no less difficult than his. Mackay went through the training first in fall 2006, along with his teachers. His blood pressure dropped so much that it was the equivalent of what he would see with a prescription pill. His teachers have been known to ask before launching into a discussion if he's done his meditation for the day — and if the answer is no, will postpone the discussion for another time. As for the students, he found them less aggressive, less anxious, even happier. And they didn't go right back into wild mode after it was over, either. The program was offered as an elective last year, and 40 MORE students signed up. This year, because of a new focus on academics, it can't be fit into the school day, but there are still more than 20 students who regularly come before and after school to meditate. "That's saying something," Mackay said. "It's hard to keep a kid here. When the bill rings, you almost have to get out of the way." Meditation also is being offered as an elective at the Museum School for the Visual Arts, with about 20 students enrolled. In January, the Drake Alternative Middle School will begin the program schoolwide, and staffs at the TeenAge Parent School and the Broadway Bridge alternative schools are both getting training. Dynah Oviedo Lim, a TUSD number-cruncher, said preliminary achievement results with only one year of data are inconclusive. But some of the findings on its social aspects are encouraging, she said. The meditators began the year with higher anxiety than a control group of students but ended with lower anxiety. Their happiness increased from mildly happy to pretty happy, while the control group reported no change in happiness levels. They also reported higher self-esteem. The program is voluntary. Students who don't want to participate can spend quiet time doing something else. And it's free to the district, which has received about $150,000 in grants from the David Lynch Foundation. Lynch, a director known for his unconventional work, which includes the "Twin Peaks" television series, has credited the practice with transforming his own life and career, and has donated millions to share it with students nationwide. Research studies, including some funded by the National Institutes of Health, have linked meditation with a host of benefits, including stronger creativity, better academic performance and reduced stress. But some critics, such as Barry Lynn, the executive director of the Washington, D.C.-based Americans United for Separation of Church and State, have expressed concern about the practice, saying it's rooted in ancient Eastern religious traditions. "It has no place in public schools," Lynn said. "There are other meditation exercises that schools could use that do not have this connection to a religious group, but no one's coming and promoting them to educators," he said. "The risk is that it helps to promote one religious philosophy over others. In the long run, this is just a bad idea." Denise Denniston Gerace, who is working with TUSD on the training, said there is a growing awareness of alternative paths to mental and physical wellness. But even with Eastern practices such as yoga taking off in this country, some misperceptions linger. And the big one, she said, is that Transcendental Meditation is religious-based. "It's a mechanical technique. The idea that it's religious is left over from 50 years ago, when it was possible to disregard contributions from somewhere else by simply saying it must be a religious practice," she said. On occasion, the critics win. Among the more high-profile cases: In 2006, parents at Terra Linda High School in California protested plans for the program and funding was withdrawn. Mackay said he hasn't received any complaints from parents, although a few have called with questions and some have asked for training themselves. Brisa Gutierrez can just draw on what she's seen in her own classroom. In her fourth year of teaching English and social studies at MORE, Gutierrez tells of one student who was troublesome for years. He was unruly and disruptive. His grades were up and down. "He was out of control, actually," she said. After he began meditation, she said, "not only did I see a radical change in his behavior, but his academic performance shot up. We're talking day and night." The boy graduated and is now employed full time. "This should be in schools across the nation," Gutierrez said, adding that many of her more vulnerable students are bombarded in their neighborhoods with violence and drugs. "This just gives them a chance to quiet the brain. And just for me, anecdotally, it's amazing to see what's happening as a result." ● Contact reporter Rhonda Bodfield at 806-7754 or at rbodfield@azstarnet.com. 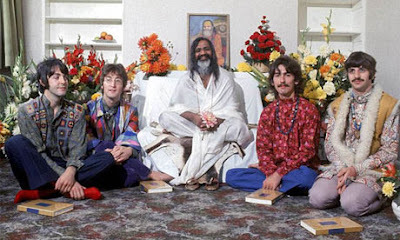 Maharishi Mahesh Yogi with the Beatles. Maharishi Mahesh Yogi started out as one kind of cultural curiosity - a lone Hindu monk who aimed to teach meditation to the world - and ended up as a different kind of cultural curiosity: the one-time guru to the Beatles. He came remarkably close to fulfilling his original intent. Millions of westerners learned Transcendental Meditation (TM), and a new word, 'mantra', was added to the English language. He survived long after the departure of the Fab Four, who decamped almost as soon as they sniffed the thin air of Maharishi's Himalayan retreat (excluding George Harrison, who turned into a genuine seeker and quiet ally). Maharishi owed his survival to two things. He was sincerely a guru, a 'dispeller of darkness', who had the good of the world at heart, despite the wags who turned TM into the McDonald's of meditation and the caricatures that morphed his white-bearded image into a pop cliché. Sincerity would have served him little if Maharishi hadn't also been a gifted teacher of India's ancient tradition of Vedanta. Many visitors who came to gawk went away moved by both qualities. Beginning in the mid-Eighties, I had the opportunity to know Maharishi as a friend. Whenever my medical practice permitted, I joined his inner circle. It wasn't necessary to be reverent in his presence. He made a point of not being seen as a religious figure but as a teacher of consciousness. Of the many memories I could offer, here is the most intense ... Maharishi had fallen mysteriously and gravely ill on a visit to India in 1991. My father, a prominent cardiologist in New Delhi, ordered him to be rushed to England for emergency care. Soon, I was standing outside the London Heart Hospital, watching an ambulance navigate the snarled traffic, sirens wailing. Just before it arrived on the hospital's doorstep, one of the accompanying doctors ran up with the news that Maharishi had suddenly died. I rushed to the ambulance, picking up Maharishi's body - he was frail and light by this time - and carrying him in my arms through London traffic. I laid him on the floor inside the hospital's doors and called for a cardio assist. Within minutes he was revived and rushed to intensive care on a respirator and fitted with a pacemaker that took over his heartbeat. I became his primary caretaker during this crisis, tending to him personally at a private home outside London. It quickly became apparent that he was totally indifferent to his illness, and there was an astonishingly rapid recovery. The hospital expected lasting health problems, but there were apparently none. Within a few months Maharishi was back to his round-the-clock schedule - he rarely slept more than three or four hours a night. When I approached him one day to remind him to take his medications, he gave me a penetrating look. In it I read a message: 'Do you really think I am this body?' For me, that was a startling moment, a clue about what higher consciousness may actually be like. As he saw himself, Maharishi knew that he had come tantalisingly close to changing the world, as close as any non-politician can who doesn't wage war. He held that humanity could be saved from destruction only by raising collective consciousness. In that sense he was the first person to talk about tipping points and critical mass. If enough people meditated and turned into peaceful citizens of the world, Maharishi believed, walls of ignorance and hatred would fall as decisively as the Berlin Wall. This was his core teaching in the post-Beatles phase of his long career before he died peacefully in seclusion in Holland, at the age of about 91, his following much shrunken, his optimism still intact. The World Health Organisation has called on governments to integrate traditional herbal medicine into their national health care systems, according to a report in the China Daily.The declaration was issued during WHO's first-ever congress on traditional medicine, staged over two days in Beijing last month, said the newspaper. "Governments should establish systems for the qualification, accreditation or licensing of traditional medicine practitioners," said WHO in the declaration. "Traditional medicine practitioners should upgrade their knowledge and skills based on national requirements." "For millions of people, often living in rural areas of developing countries, herbal medicines, traditional treatments and traditional practitioners are the main — sometimes the only — source of healthcare," Margaret Chan, WHO's director-general, told the China Daily. "The two systems of traditional and Western medicine need not clash. Within the context of primary healthcare, they can blend together in harmony, using the best features of each system. "She added: "Many countries have brought the two systems together. Here in China, herbal therapy of proven utility in many disorders is provided in state hospitals throughout the country, alongside conventional medicine." Steamboat Springs — Nancy Spillane wants to spread the serenity. As director of the Lowell Whiteman Primary School, Spillane has seen the success of a new type of teaching method that uses Transcendental Meditation to instill a sense of concentration and focus in the school’s fifth- through eighth-grade students. Practicing for 20 minutes twice a day and instructed by meditation coaches from the Transcendental Meditation Center of Boulder, the students are in their second year of using meditation in the classroom. 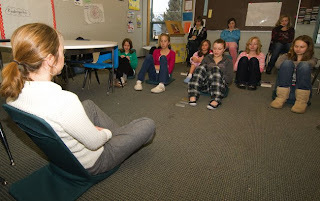 Spillane, who has been an educator for about 30 years, said she first saw the results of the meditation technique on TV a couple of years ago, when an interview with administrators in Detroit and Fairfield, Iowa, convinced her to take a look at bringing meditation into her school. “I stayed away from the research the meditation centers put out, and I found research from medical schools and journals,” she said. Several journals, including “American Journal of Hypertension” in 2004 and the American Medical Association’s “Archives of Internal Medicine” in 2006, have found benefits from Transcendental Meditation, including a decrease in blood pressure and increased concentration in students. Spillane also visited a school in Iowa where the technique was being practiced. Dan Swanson and Gail Lynch, co-directors of the Boulder meditation center and coaches for the school, teach each group of students how to properly meditate, then visit once a month to check their progress and technique. The David Lynch Found­ation, an organization set up by “Mulholland Drive” film director David Lynch to bring Transcendental Meditation around the world, funds the program at the Lowell Whiteman Primary School. This is the second school Swanson and Lynch have worked with, and they said three other schools are in talks to bring meditation into the classrooms. “It’s doing exactly what the research said it would,” Spillane said. Parents have reported lower stress at home, and students have become better test takers, she said. Overall test scores have not been compared yet because the students have not been tested two years in a row on the meditation regimen, but Spillane said individual test scores have increased across the school. “Some of that we can attribute to them maturing, and some we can attribute to TM,” she said. Seventh-grader Patrick Mill said the meditation time is an important part of his daily routine because it allows him to unburden himself from daily concerns. The technique also has helped in the family life for some students, such as eighth-grader Aly Bemis. “My mom and I argue a lot anyways, but (now) it’s a lot easier to slow down and understand her side,” she said. 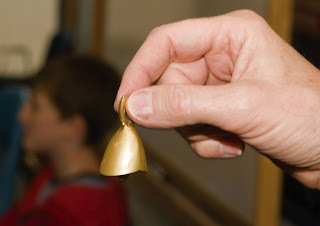 The younger students in the school, from kindergarten to fourth grade, practice quiet time every day before they are taught the meditation technique in fifth grade. Many of the benefits claimed from Transcendental Meditation are quantifiable, but some of the benefits go beyond the school. According to Transcendental Meditation literature, enough people practicing the technique can even bring about world peace as it is exuded by meditation practitioners and transferred to everyone around them. But for seventh-grader Quinn Cain, the results are physical. The program is not affiliated with any religion, but Spillane said she would like to proselytize the method to other schools in Routt County. “One of our goals really is for this to spread to as many children in Routt County as possible because, boy, it’s really a great thing for children,” she said. Mario Orsatti, the national director of comminication, just informed us that on the front page of the Metro section of the Washington Post this beautiful article with large color photo appeared. From afar, the shiny office building seems like so many others in the Washington area: glistening, glassy, gray. But inside there are signs of something different. Sunlight flows through the building, end to end, side to side. Paintings and plants are arrayed throughout. Everyone, no matter where they sit or what job they hold, can see the world outside. Watch this beautiful example of a well prepared video. The students of Maharishi University of Management present the unique features of MUM in a very direct, simple, and engaging way.